Imagine stalking a Wild Boar within 100 to 125 yards on a crisp morning within the heavily wooded and rolling hills of the Ozark Mountains in Missouri while you hear a squeal in the far distance over the ridge on a rifle hunt. Most hunters don’t realize just how big Wild Boars are until they see them live for the first time. Our very experienced guides will assist you in getting within range to offer you the best shot available to get a quick and clean kill. With our Guides many years of guiding knowledge and animal behavioral understanding helps increase your success rate. 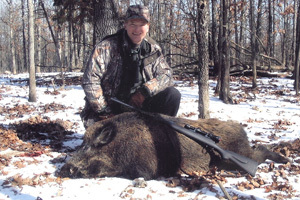 High powered rifle hunts are not restricted in the state of Missouri, so we encourage Boar rifle hunters to bring either a .270, .300, .308, or 30-06 caliber rifle with shells. We do allow AR-15s, but with only large caliber ammunition! We maintain a rifle range on site for sighting in and making any other necessary adjustments prior to your hunt. For those who want to avoid the hassles of traveling with a gun, we provide rifles and ammunition for $45 a day. We have over 30 years of experience providing rifle hunters a high success rate to take home a trophy of a lifetime and excellent table fare. There is definitely nothing more breathtaking than a rifle hunt at High Adventure Ranch!